Liverpool striker El-Hadji Diouf has escaped with a two-match ban for spitting at Celtic fans last week. It had been expected that Uefa would suspend the Senegalese striker for four games. But Uefa said it had taken into consideration the provocative behaviour of the Celtic fans during the incident in last Thursday's Uefa Cup quarter-final. Celtic were fined £2,300 for the conduct of their supporters in the unsavoury episode, which saw Diouf spit into the crowd towards the end of the 1-1 draw at Celtic Park. Diouf, who offered a personal apology to the fan he spat at and was fined two weeks' wages by Liverpool, will be suspended for the second leg at Anfield. Liverpool manager Gerard Houllier had already decided not to include the 22-year-old in his squad, but should the Reds progress to the final, Diouf would be available. "The control and disciplinary body ruled that Diouf was guilty of improper conduct," a Uefa statement read. "But it added that the provocative behaviour of the spectators should also be taken into account as a mitigating circumstance. 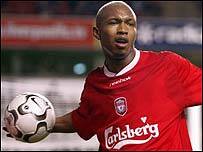 "Diouf has apologised publicly for the spitting offence, and has been fined two weeks' wages by his club. "Liverpool have also indicated that they will make a donation of £60,000 to a Glasgow charity of Celtic's choice." The general secretary of the Celtic Supporters' Association has expressed disbelief that the Glasgow club had been fined for the behaviour of fans. Eddie Toner said: "It seems a bit odd considering the player himself has apologised to the two fans. "As far as I understand, there were no charges brought against the fans either so it is a bit bizarre that Uefa has fined Celtic. It seems a strange decision. "I was very impressed with the way Gerard Houllier handled the whole situation with Diouf. "Houllier had already decided not to play him on Thursday anyway so, effectively, it is a one-game ban. "Hopefully, it will draw a line under the whole incident." The BBC will be screening the return leg of the Uefa Cup quarter-final between Liverpool and Celtic on 20 Thursday at 2000 GMT. "Diouf can consider himself lucky"